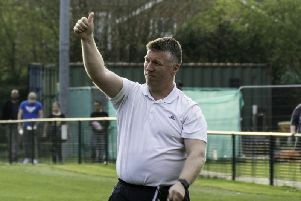 Burgess Hill Town head coach Simon Wormull knows his side aren't going to get the game-changing decisions while his side are at the bottom of the table. Wormull's side lost 1-0 to Kingstonian but the game changed on a penalty that never was. In the 41st minute, Andre McCollin saw his thunderous effort rebound back off the crossbar and then oments later, a potential handball on the Kingstonian line was waved away by the referee, who Wormull said 'was the only person in the ground' not to see the handball. . The visitors then scored the winner in the 84th minute. Wormull said: "I thought we started the game really well, we had the chances, we hit the crossbar and their midfielder made a great save on the line. "The video has shown that was true. I think the only person in the ground not to see it was the referee. Those decisions are game-changing and when you are at the bottom you don’t get that sort of luck. "Somebody gave me the stat that it’s been 65 games since we have had a penalty. You just think wow, that’s unreal. "We realise we are fighting against the officials and luck and stuff like that and that’s why we have to work hard. But I thought we did alright Saturday, the only thing that was missing was taking a chance and if we had done that I think we would have gone on to win the game. "When you don’t take that chance you always give the opposition to put a bit of pressure on you which they did really well. "They only needed one chance."